Hi! My name is Julie, and I am the owner of Two Chicks Quilting. This shop was years in the making. Since I was young, I loved to sew, and a few years ago, it came time for me to come up with a way for me to share my love of sewing and quilting. I envisioned a place where someone could come learn to sew without making a huge investment in a machine and tools until they knew that, number one- they were going to actually enjoy sewing, and number two- they had more knowledge as to what to buy. So, I put a plan together for a fully-stocked SEWING STUDIO! Machines, cutting tables, cutting mats, rotary cutters, rulers, irons, etc. all provided for my customers. I made a post on Facebook and had 8 ladies interested in Beginner Sewing classes, and within a month of my “plan” I was in business! I called my business “Sew Simple” and taught Beginner Sewing and Quilting for all ages. I still worked full time, so my classes were all offered in the evenings and on weekends which was a huge hit for working women! A couple of years passed and, along with the great help of a friend of mine, in January 2016 Two Chicks Quilting was born. I got a Handy Quilter Infinity longarm machine and began the journey to build a full service quilt shop. Within a couple of months, Nicole was managing the shop, so we could have regular business hours while I continued to work at my full-time job. I teach classes in the evenings and have been able to add more kids' classes and workshops to the mix. We're also making plans to add Guest Teachers to provide more advanced quilting classes. I am pleased that Two Chicks Quilting has evolved into a shop that provides an exceptional line of high-quality fabrics from leading collections as well as patterns and notions to customers who share our passion! 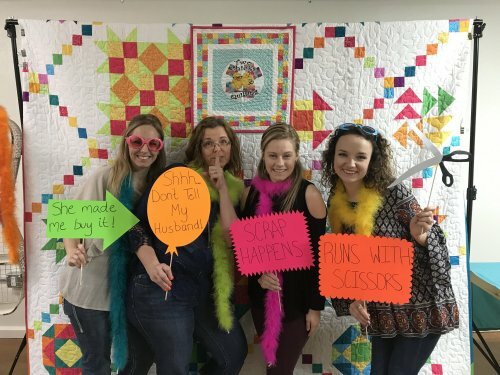 Two Chicks Quilting provides longarm quilting services, embroidery services, and beginner sewing and quilting classes for all ages. We also provide custom quilt services for construction of any size quilt you choose, including Memory and T-Shirt quilts. Whether designing and making a Memory quilt, teaching classes, longarm quilting a client’s quilt or helping a customer select the perfect pattern and fabrics for their next project, Two Chicks Quilting is devoted to providing friendly, personalized service and continued support to make sure Quilting Chicks of all skill levels have a fun, enjoyable, and successful sewing experience!